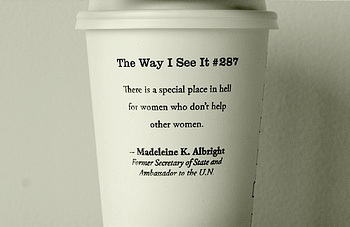 I’m embarrassed to say that there was a time when I didn’t see the value in helping others, especially women. Years ago, I had a big shift and realized that helping others succeed doesn’t make me any less of a person. In fact it makes me and those around me stronger. Perhaps it’s because I didn’t always help women that I am now able to better recognize when women are trying to manipulate and sabotage other women. This weekend I attended an event – with men and women – in a positive setting designed to build others up. One person in particular didn’t seem to be a fan of mine. And that’s okay. What made me lose my cool was when she set a family member of mine up to fail. Not cool. I instantly took satisfaction in 3 things: 1)I am no longer like that; 2) Everyone in the room recognized what was going on; and 3) There is a special place in hell for women who don’t help other women. Though I don’t believe in the same hell as Madelyne Albright, I do believe there are women who create their own “hell” right here by 1) alienating other women who could have otherwise been allies; and 2) damaging their own credibility in a manipulative attempt to smear someone else’s.